The gap between desired and observed fertility in Europe. Part 2: Childlessness levels. To better understand the effect of postponement we tried to measure it by calculating the effect of time spent on contraception while in a union by women who want to have children, a ‘conscious’ way to postpone childbearing. Involuntary childlessness has gained momentum in mainstream media, which attribute a large part (if not the totality) of the blame on the postponement of childbearing: women wait too long to have children, they don’t hear their biological clock ticking and bam! no children. Ever. Delaying childbearing to later ages has undoubtedly a repercussion on the biological ability to have children, but it is hardly a simple component of the total effect. What the mainstream discussion is often missing on is that the great majority of children are conceived in unions, hence it is a couple’s decision to have children. Indeed, being single is an important if not pivotal deterrent to motherhood, usually delayed until union formation. This is why it is important to consider factors such as union dissolution risk to appreciate the variation in involuntary childlessness. To better understand the effect of postponement we tried to measure it by calculating the effect of time spent on contraception while in a union by women who want to have children, a ‘conscious’ way to postpone childbearing. This is a preview of average population childlessness obtained through simulation using 3 variables: celibacy (%of women ending up single and never entering a union), divorce (%women previously in a union but currently without a partner), and waiting time, the average time spent on contraception at the beginning of a union by a woman who wishes to have children. The GAP between desired and observed fertility in Europe. Part 1. 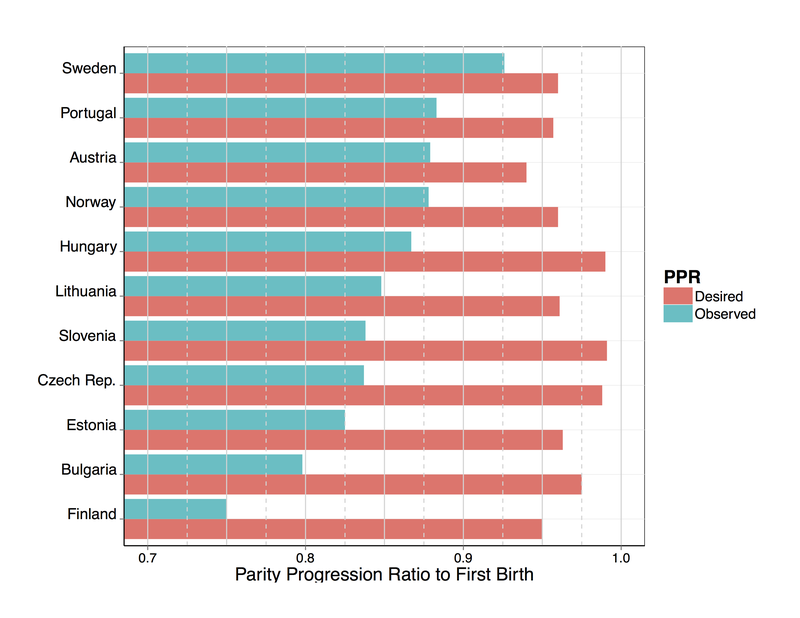 Using data from the FFS and the Human Fertility Database we have recomputed desired fertility estimates using Rodriguez and Trussel (1981) method and simulated the Parity Progression Ratios to first births for women in 11 European countries. Working paper soon to follow. Author acarioliPosted on 28 October 2015 20 January 2016 Categories childlessness, Europe, fertility, ggplot2, RTags Europe, FFS, Human Fertility Database1 Comment on The GAP between desired and observed fertility in Europe. Part 1.